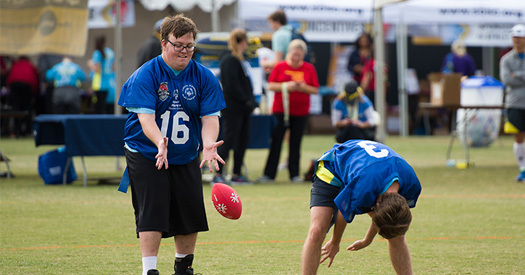 Flag football is an exciting, new sport offered to Special Olympics Southern California athletes. In the spring of 2018, flag football kicked off as a demonstration sport, and athletes trained and competed locally only. Starting in 2019, it became an official sport, and athletes are eligible to compete at regional and Southern California competitions. Flag Football is also offered as a unified sport as athletes with and without intellectual disabilities train and compete together on the same team. Flag football caters to athletes of all abilities and teach skill development in a number of areas including: passing, route running, defensive strategy, and more. Training guide coming soon!